Too often, television shows are over as soon as they've started. We seem to always want the next big thing to trend on and we've forgotten some of the classics which have made TV what it is today. Some of the shows from the past have made tru impacts on our lives or the lives of our parents. So when I heard CBS Home Entertainment and Paramount Home Media Distribution would be releasing MY FAIR LADY: 50th ANNIVERSARY EDITION, I knew it would be a perfect gift for my mother. Available on October 27th, 2015, My Fair Lady: 50th ANNIVERSARY EDITION in on Blu-ray + DVD Combo Pack. Featuring a brand new 4k restoration from an 8K scan of the original negative, and other surviving 65mm elements, painstakingly restored by acclaimed film historian and preservationist Robert A. Harris. 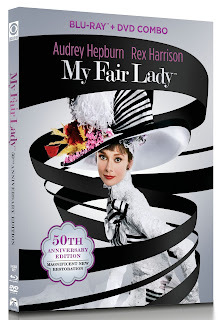 The synopsis says "Audrey Hepburn and Rex Harrison, MY FAIR LADY: 50th ANNIVERSARY EDITION arrives in collectible packaging with an entire Blu-ray disc dedicated to 90 minutes of special features including a variety of original trailers and featurettes that were used in theaters to promote the feature film, as well as footage from the film’s Los Angeles and British premieres in 1964."